HE’S HOME FROM HIS FIRST DAY of his junior year at Faribault High School. My 16-year-old doesn’t talk much. Prying information out of him is akin to pulling teeth. So I try really hard not to pepper him with questions. But I can’t help myself as I attempt to phrase questions that don’t require a simple “yes” or “no” answer. “How was your first day of school?” I ask. I follow him into the kitchen where he is downing a glass of milk. He loves milk, always has. He rattles off a list that includes AP physics, pre-calculus, chemistry, psychology, American government and computer aided drafting. “You’re taking a lot of hard classes,” I observe. He shrugs, doesn’t really answer. I know that for him, my scientific, mathematically-inclined, computer-oriented son, who scores way above average on those assessment tests that everyone else whines about, these classes are a perfect fit. I am glad that I am not him; I wouldn’t like, or do well, in most of his classes. I am not the science and math type. He settles in with his laptop on a corner of the sofa while I continue working on a travel feature in my nearby office. I rush into the living room. I’m not going to let this moment of conversational opportunity pass. “What do you mean new bathrooms?” I ask. “They got new walls, new toilets, doors,” he briefs me. “They didn’t have doors?” I probe. Not in one of the bathrooms, the one no one used, he says. That ends our short exchange. He’s focused now on his computer screen, not really caring if I hear anything more about his first day of his junior year of high school. After all, he’s told me the important “stuff” about new computers and upgraded bathrooms with new toilets and doors. 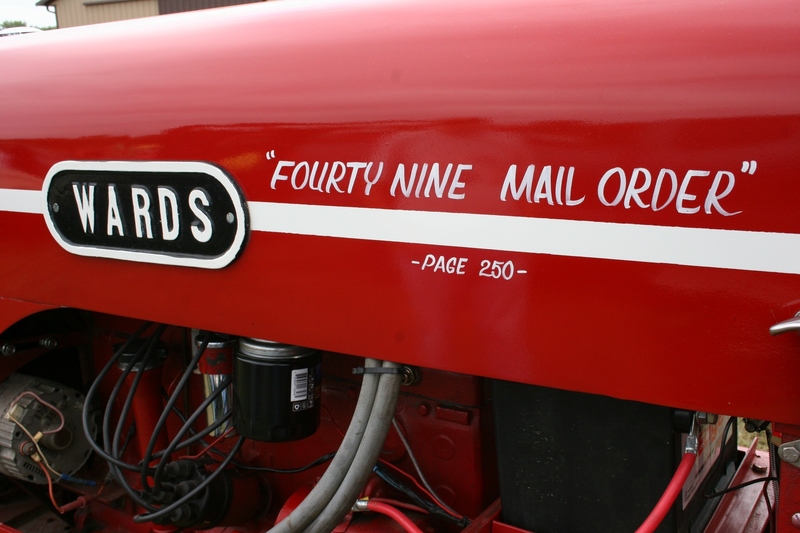 Yes, folks, if you had attended the Rice County Steam & Gas Engines, Inc., Show this past weekend in rural Dundas (like me), you would have discovered oddities and attractions worthy of a stop-and-look second look. 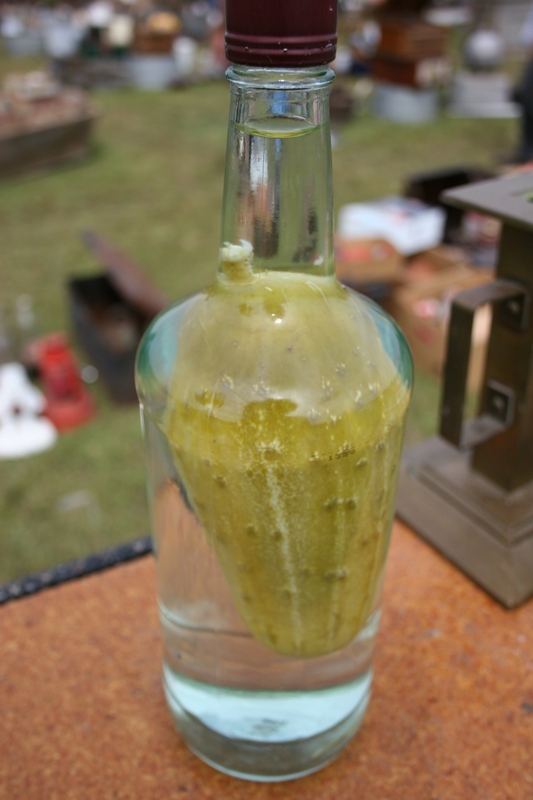 …a peculiar overgrown pickle (or a cucumber) preserved in a slim-neck bottle and for sale at the flea market. Puzzled by this specimen, I asked another gawker, “How did that get inside the bottle?” He figures a small still-on-the-vine cucumber was inserted into the bottle and allowed to grow. Duh. 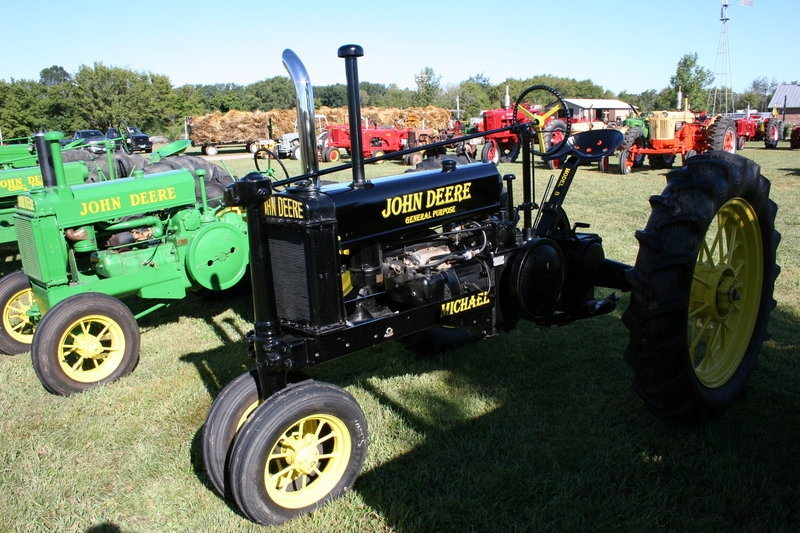 …the black John Deere tractor. Again, I am puzzled. Why is this John Deere General Purpose Model B tractor painted black instead of yellow and green? 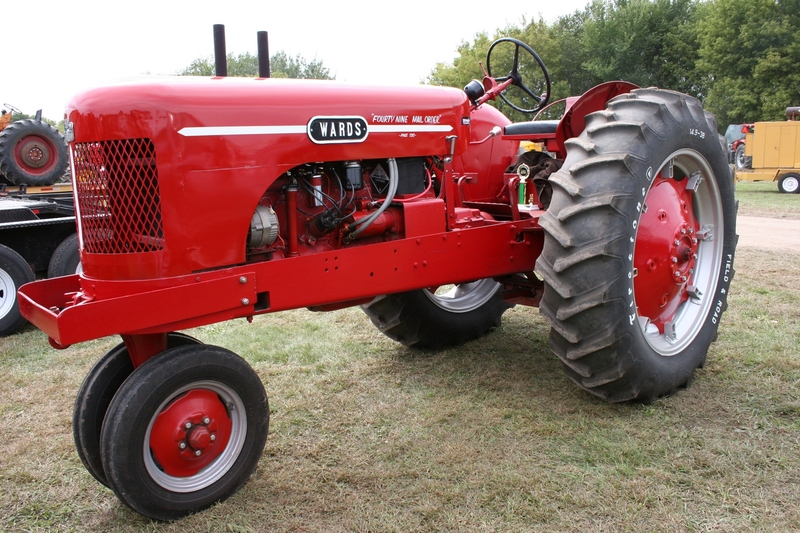 Why is “MICHAEL” imprinted on the tractor? Is Michael the owner? And if so, can he answer my question? 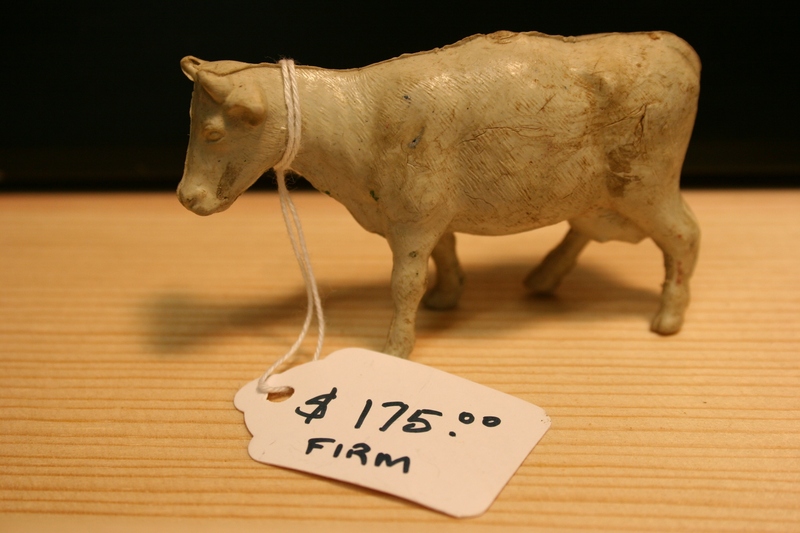 …the amazingly expensive toy cow. Priced at $175, the rather forlorn-looking animal wasn’t flying off the shelf. Then Mankato collector/seller Steven M. Ulmen clued me in that the overpriced price was purely a joke. He would, he said, sell the miniature cow for a buck, or maybe even give it away to a kid. Steve also has a serious side. This former probation officer is an author. I left without a cow, but with two of his books, Blood on the Prairie: A Novel of the Sioux Uprising and his recently-published Bad Moon Arising. …J. J’s Tractor Parts of Jackson stashes bins full of parts inside a semi trailer and travels to shows like the one in Dundas. The guy I talked to, who may or may not have been J.J., has been a traveling partsman since 1968. Three years ago he acquired the user-friendly semi trailer. 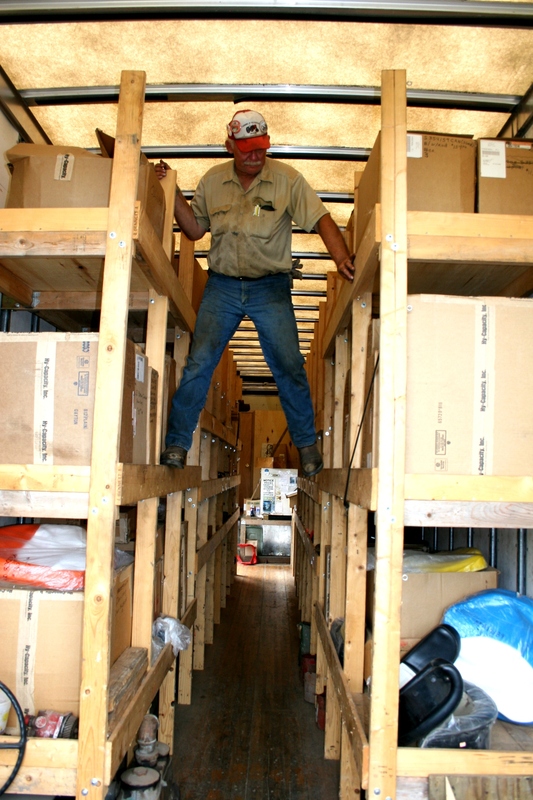 I wanted to suggest, however, that he add a ladder to his inventory. 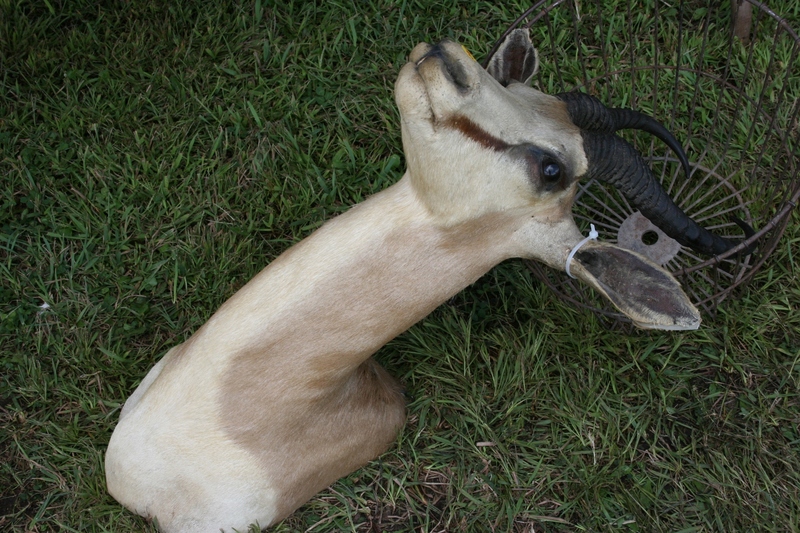 …an antelope (I think) head. Need I say more? 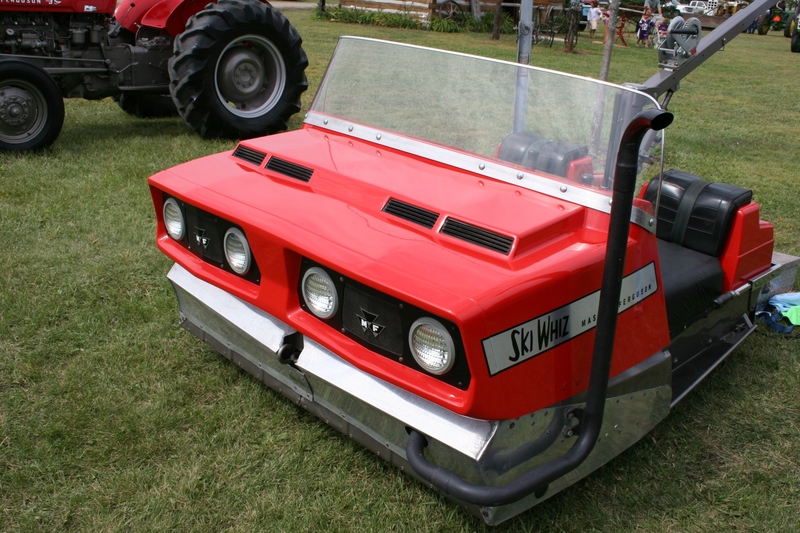 …try out this Ski Whiz from Massey Ferguson. This dual-seat snowmobile features a dual clutch steering system. No promises are made regarding speed. 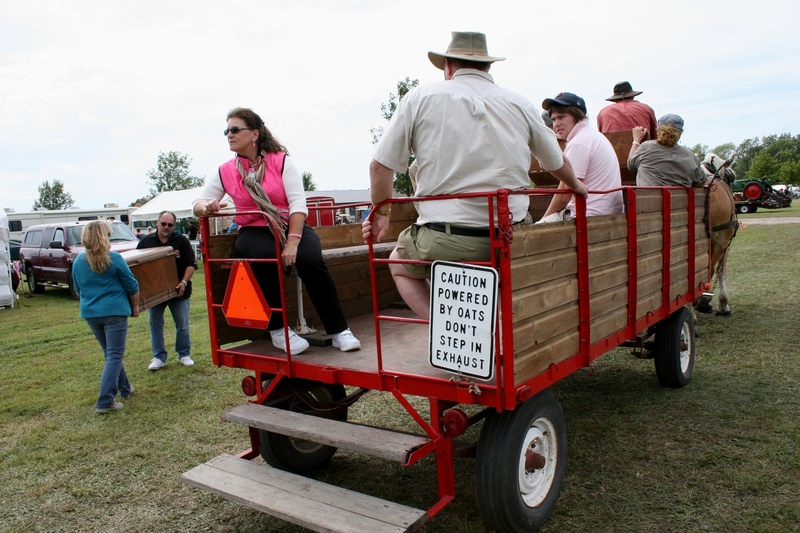 …on the back of a horse-drawn wagon: CAUTION POWERED BY OATS DON’T STEP IN EXHAUST. So there, folks, you have it, just some of the many oddities I discovered at the Rice County Steam & Gas Engines Show. CHECK BACK for future blog posts about the Dundas event.